Nationwide, real estate pundits are all over the map with their predictions for 2019. Some say interest rates are rising and will impact value and sales. Some say inventory is tight and prices will rise but not as fast as in the last few years. Some say millennials will be driving the market in 2019, especially the first-time market and will be the largest segment of buyers over the next 10 years. So… what about the Sedona and Verde Valley market for 2019. First, we need to look at 2018. Prices are at or near all-time highs in all areas of the Verde Valley. The median sales price for single family homes for Sedona is $560,000, Cottonwood/Cornville at $265,000, Camp Verde at $247,000, and Lake Montezuma/Rimrock at $215,000. 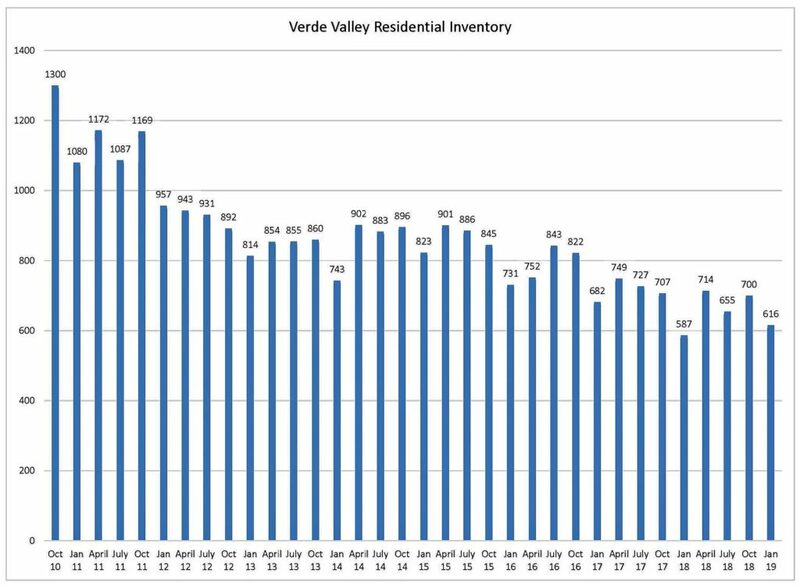 The number of residential sales in the Verde Valley in 2018 increased 9.2% over 2017 and inventory continues to be at or near 10-year lows. Cumulative days on market are at or near historic lows, Notice of Trustees Sales(foreclosures) are at recent lows. Based on all this historic data, it would be hard to argue the fact the real estate market in the Verde Valley is hitting on all cylinders. So, to me it looks like more of the same for 2019, provided that interest rates do not increase too much, our feeder markets of the Upper Midwest and California remain strong, and the overall US economy does not slip into a recession, all outside forces we cannot do too much about. “A survey of economists by Reuters this week shows that most expect the chance of a recession in the U.S. is still low, at 35%, although the survey also showed that the median probability of a recession has inched up from 30% in the past month. Last week, Larry Summers, a Harvard economist and former Treasury Secretary during the Clinton Administration, said there’s a nearly 50% chance of recession by 2020. The median price of a single-family home rose to $560,000 the second highest amount since 2007, topped by only the $590,000 in 2006, a 6.6% rise in 2018 over 2017. The number of transactions showed another solid increase to 511 sales up 10% over 2017. From 2010 to 2016 annual sales bounced around in the 410 range. The increase in the number of sales in the last two years represents a 25% increase and the highest number of sales since 2005. Vacant land transactions for 2018 came in at 176, a 20% increase over 2017 and a 52% increase in the last two years. With the dramatic increase in the number of sales you would expect more strengthening in the median price, which has been hovering in the $145,000 to $150,000 range for the last 6 years. There is currently about a two-year supply of vacant lots for sale, but we all know with the limited supply of privately held land available that at some point in the future, this limited supply will result in increased prices. It is interesting to note that in the last 10 years according to Sedona Community Development records, there have been 295 building permits issued for single family homes, 104 in the last three years. Good view, easy to build on lots are becoming harder to find. The luxury market, over $1,000,000, represented over 10% of the total number of single-family homes sold in 2018 with 53 sales. This is right up there with the strongest luxury market that the Sedona area has ever had. Currently there are 64 homes listed over $1,000,000 which is 26% of the total homes listed. Cumulative days on the market came in at 85 days, a 21% drop from the 107 days in 2017. Effectively some of the shortest days on market in recent Sedona real estate history. With days on market at historic lows this will be a bellweather indicator when the market starts to change. The median sales price for Condos and Townhomes in the Sedona area was up 5% over 2017 to $294,000. The number of transactions for the last 12-month period is 133, this is the highest number of condo and townhome sales in the Sedona area since 2003. The median sales price for single family homes in the Camp Verde area for 2018 was $247,000 up 11% from 2017. Camp Verde came in with the highest year over year price increase at 11%, followed by Rimrock/lake Montezuma at 8.8%, Sedona at 6.6%, and the Cottonwood/Cornville area at 6%. The number of sales came in at 113 the same as 2017. The median sales price for single family homes in the Rimrock and Lake Montezuma area for 2018 was $215,000 up 8.8% from 2017. The number of sales was down slightly to 70 sales for 2017. The Lake Montezuma/Rimrock area has been the star of the Verde Valley real estate market for price increases since the bottom of the market with an impressive 262% increase since 2011. The median sales price for single family homes in the Cottonwood and Cornville area for 2018 was $265,000 up 6% over 2017. This is the highest median sales price in this area ever! Even with the record median sales prices numbers of sales were off 4.3% to 538 sales, which is still one of the strongest years ever. All real estate is local and that is no different for the Verde Valley. The shortage of inventory continues to be the major factor in Verde Valley real estate. Numbers of sales have increased and inventory remains tight. Interest rate increases may have an impact on our market by effecting our feeder markets. If there is an economic slowdown, real estate will not be impacted like it was in 2008 because the economy is not riding the back of the real estate industry as it was in 2004-2007. So overall in 2019 with the strong demand we have and tight inventory it will be a seller’s market with continued upward pressure on prices.